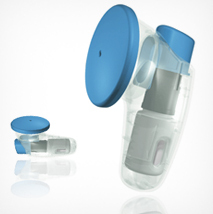 Designing successful Medical Products is more than just hard work. Bayly has the experience that counts when it comes to helping with the design of your product. With experience in the design and development of drug applicators, medical devices and pharmaceutical packaging and dispensing, Bayly can assist your team to realise your goals. Bayly has specific expertise in the design of transdermal drug delivery and applicator design having with worked with the two pre-eminent Australian companies working in this field; Acrux Ltd and Phosphagenics. Radioactive medicines and treatments is another area where we have specific experience working with Vitamedical and Sirtex Global. Bayly’s expertise in the design and development of OTC packaging and dispensing systems has been used by companies such as GSK and Pfizer and OTC products for Dr. Scholl internationally. Bayly’s adaptable approach to interfacing with your organisation’s 21 CFR compliant systems provides you with the best value for money. Compliance processes and their structured organisation vary between different companies and so we do not have a single “cookie cutter” approach to our work processes. In each case, we take time to understand your needs and tailor our approach to suit. At Bayly, we will ensure that our planning tasks and outcomes comply with the requirements of your system in order to maximise value, reduce rework and reduce compliance costs. As a manufacturer in this field, you need to engage a team that understands GAMP requirements and is familiar with how to work within your team’s project framework. CSL have depended on Bayly’s expertise in the development and commercialisation of their fibrin blood products for the US Red Cross. Developing devices and treatments is about ensuring the safety of the user. Simple, reliable and elegant solutions are always the best solution and we are skilled at helping you realise them through our highly developed design research and design and development processes. The next step – contact Mark Bayly on 03 9413 9000 or email us to discuss your needs. Bayly’s design expertise has assisted Acrux Ltd transform itself over 10 years, from the laboratory to a publicly listed company with a market capitalisation of $365 Million. “Bayly's hard work, timeliness and depth of technical expertise has been invaluable to our company… I had previously seen Bayly's work at Glaxo in the early 90’s and I was keen to seek them out for the work at Acrux”.